This winter, bring warmth to your coldest rooms by installing space-smart heaters that will make their presence felt—though not necessarily seen. Every home has one—a room that never feels quite comfortable in the winter, no matter the set temperature. To supply extra heat to these chilly areas, some homeowners use space heaters, reasoning that warmer, habitable spaces justify the likelihood of higher utility bills. Others choose to install baseboard units instead, taking on an up-front expense in hopes of saving energy costs down the line. The catch? 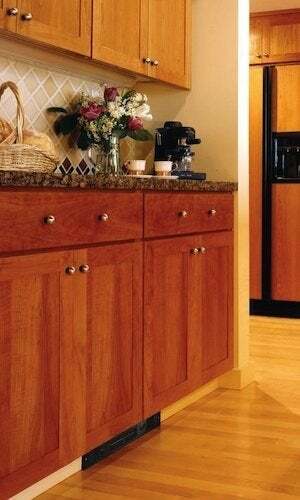 Baseboards are bulky; a lot of times, they simply don’t fit. Fortunately, there’s another option to consider—namely, kickspace heaters. Also known as toe-kick heaters, these often-overlooked components deliver the best of both worlds, cost-effective heating in a compact package. 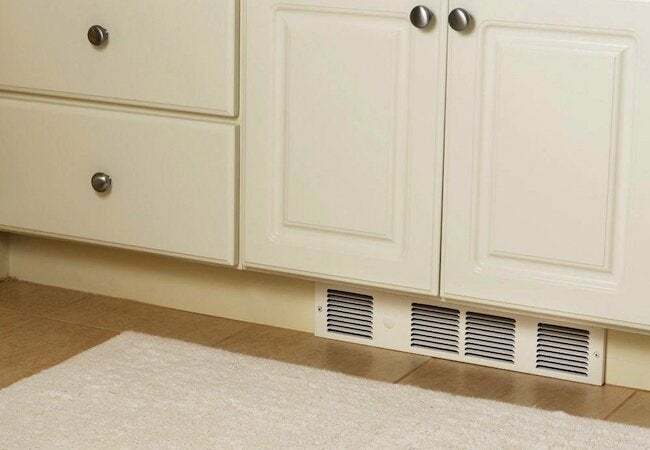 Their modest size means that in a room with a challenging layout, one that would not accommodate a baseboard unit, a kickspace heater may be able to fit in seamlessly, installed at floor level beneath cabinetry or even inside the wall or floor. According to Daniel O’Brian, a technical specialist with SupplyHouse.com, “Kickspace heaters are designed to be inconspicuous.” In fact, their name refers to the hidden spot where they are frequently installed—that is, the inset cavity along the bottom edge of bathroom vanities and kitchen base cabinets. Here, kickspace heaters remain largely out of sight, working virtually invisibly to supplement the warmth provided by the main HVAC system. There are two types of kickspace heaters in common use today. Though alike in many ways, they are separated by a single yet crucial design variation. Both draw in cool air from the surrounding area and gradually return it to the room after raising its temperature to a preset level. 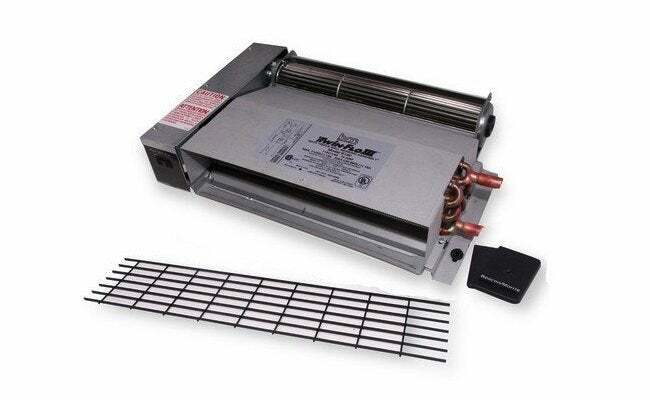 Both types of heater warm the captured air by exposing it to a set of heated coils. Here’s the point of distinction: A hydronic unit heats up those coils by pumping in water from the boiler or hot water heater. In the other type, the coils are heated by means of electricity. You probably wouldn’t be able to tell the two apart by their performance, but when it comes to installation, each has different basic requirements. O’Brian also offers the reminder that even in mild climates, kickspace heaters are not suitable as whole-home heaters, if only because they offer limited coverage. “They are designed as, and work best when used as, complements to the central heating,” he says. It is important to note, however, that a kickspace heater doesn’t need to operate in lockstep with the main HVAC system. On the contrary, kickspace heaters are typically set up to be independent and separately configured. That arrangement gives the homeowner precision control over the temperature of the room in question, particularly when the installed kickspace heater is a model that offers multiple fan speeds. For many, heating can be as much a source of frustration as comfort. If chilly rooms are undermining your enjoyment of your home, reclaim your spaces with a cost-effective, inconspicuous kickspace heater. Need help making your selection? Visit the experts at SupplyHouse.com. A leading vendor in the category, the company offers products from all major manufacturers, including Beacon/Morris, Cadet, Broan, and Slant/Fin. Have a happy, warm winter!